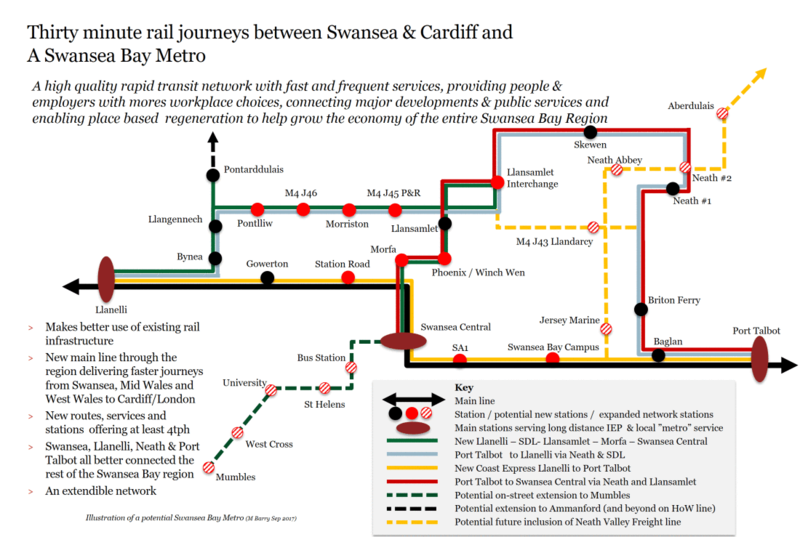 Looking for possible privately-funded rail projects, I have come across the Swansea Bay Metro on Wikipedia. Wikipedia outlines the project like this. A new station on Station Road. It is a comprehensive project that would probably cost over a £1 billion. This could just be the sort of project that Chris Grayling felt could be developed. This study document from Professor Mark Barry gives more details of a possible proposal. It certainly is a comprehensive project. That’s about £500 for every adult in south Wales – that does not sound like a bargain to me. True Crossrail and Thameslink cost a lot more, but they are going to generate a LOT of revenue when fully operational. I know! I did the calculation as well. But then as the money will not come from taxpayers, I suspect that if it was developed it would be worhwhile. I also feel, that anything around Swansea Bay should be developed in conjunction with tidal power stations. Have you ever taken a train to Swansea? It’s a long way. The suggested route along the cost would open up the coastline and make the City around two hours from London and 30 minutes from Cardiff. This could change the economy of the area and make the scheme one that could be financed privately. I agree with you! Federick Snow’s plan for the Severn would have done the following. 1. Generated 10% of the electricity we need. 2. A second Severn Crossing south of Bristol. 3. Created a new Airport with a South-West/North-East runway in the middle of the river, which would have had a low-noise footprint and a high speed rail link to London courtesy of Brunel’s Great Western. 4. Stopped a lot of the flooding along the Severn. It was a big mistake not to build it.